[AD] Opacity slider is wrong!! In Designer the opacity slider for fill and stroke is not showing the right grayscale values for opacity. The slider should go from black (left) to white (right) instead, because 0% opacity is black and 100% opacity is white. That's the case in all graphics and video software I know of working with opacity. And that's for a reason: we think of black as a light turned off and white as a light turned on. And even the same way as opacity values gets stored in the files: 0 is black, highest value is white. It seems like in this case not OPACITY is shown, but TRANSPARANCY instead (the inverse of opacity). But the label clearly says OPACITY and the parameter opacity is being used in the rest of Designer too, so the slider should show the OPACITY value too. Next to this there is a checkerboard background behind the grayscale range of the slider, but both the white end as the black end of the slider let through the same amount of this checkerboard background (both around 50%). So this doesn't show users at all what end of the slider results in a fill or stroke being transparent, so doesn't make any sense like this and only makes it even more confusing. slider from left to right going from black to white, where the checkboard shines through on the left side (black), but not on the right side (white). And to make it even more intuitive to users I'd move the color-circle on the left of the slider to the right. That way it would be even clearer to users when this color is seen for the fullest (when the slider is moved to the right). Please change this!! This is wrong and very frustrating for professionals working with graphics all day. Especially when using all kinds of different graphics and video software together. And because of the industry standard not something we should get used to learn the other way around. At 100% opacity the object is visible and you see black. At 0% opacity the object is invisible and you see white. That slider doesn’t have a white end and a black end, it has a 0% opacity end (where the chequerboard background shows through) and a 100% opacity end (where the chequerboard background is fully obscured by the black ‘ink’). ...The slider should go from black (left) to white (right) instead, because 0% opacity is black and 100% opacity is white. Wouldn't it be better if they just showed the actual colour over a checkerboard? I.E. a 100% opacity end (where the chequerboard background is fully obscured by the black ‘ink’). This enlarged screen shot from my Mac shows the same chequerboard as in Friksel's screen shot from a Windows PC. The chequerboard certainly is not fully obscured by black at the dark end. It gets darker from left to right, but still has contrast between the squares at the dark end. If the right end looks fully obscured by black on your display, then I suspect that there's a problem with your display calibration or the display profile or the system's colour management. If the right end looks fully obscured by black on your display, then I suspect that there's a problem with your display calibration or the display profile or the system's colour management. No, the only problem is that I was looking (probably not closely enough!) at the OP’s screenshot. Even without moving the slider control away from that end of the track I can see the chequerboard background clearly on my Windows machine. We already do this for noise, I don't see why it couldn't be done for the opacity slider as well. It does make it way more clear. Thanks for the suggestion. I will pass this to the dev team. Yes, nice addition indeed and guess by showing the color on top of the checkerboard that would make it much clearer for everybody, no matter if your background is print or video. Great addition to add a combobox for value input too so we can see what value the slider actually has and to be able to enter as a value. If Designer and Photo 1.7 will have the controls like this, that would be nice! The slider must allow an absolute opacity to be set,as there is currently no way to set it. Many design systems define colors with opacity for example material design has black at 54% and 87% opacity and it's impossible to set these in Affinity. You don't want to set it on the layer you want to set it in style. It's impossible without being able to set absolute values. The control for the layer opacity and fill stop opacity is the one that should be used here as they support absolute values. The slider must allow an absolute opacity to be set,as there is currently no way to set it.﻿ Many design systems define colors with opacity for example material design has black at 54% and 87% opacity and it's impossible to set these in Affinity. I don't understand that. Why can't you set those values? At the end of the slider there's a field that shows the opacity in %, and you can set that value either by adjusting the slider or typing into the % box. Not the one on the studio color panel the one on the fill drop-down color panel (windows). 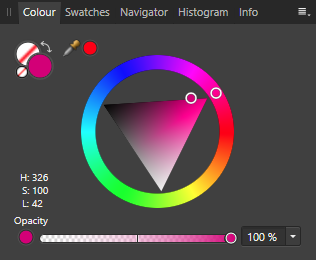 The studio color panel has abs opacity. The fill drop-down doesn't it just had a dumb slider. Why these two controls are different makes no sense. 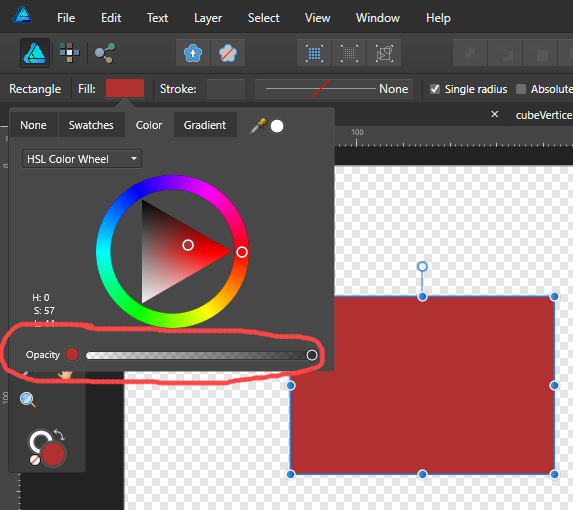 So from the fill drop down color panel you then go to the studio color panel to set opacity (if it's visible and you know opacity is there) set opacity, this closes the fill colour drop-down which you then have to reopen to amend the colour. It could all be avoided by making the sliders the same control. As it is it's poor ux design. Thanks for that clarification. I missed that important point. Note that if you happen to have the Color panel open, you can just watch the numeric opacity value there while you adjust the slider in the Fill drop-down, which makes it a bit easier. However, I agree with you that the direct numeric input should be available everywhere we can set the opacity.